Part of the Adonis ironwork lighting range, a superb quality scrolled wrought iron semi flush ceiling light from Elstead Lighting and designed by Quoizel. If you have a period home, no longer do you have to traipse around auction rooms and antique shops for a perfect period light. With a vast selection of light fittings being designed specifically for older style property you’ll be amazed at just how easy it is to find one that suits your decor. 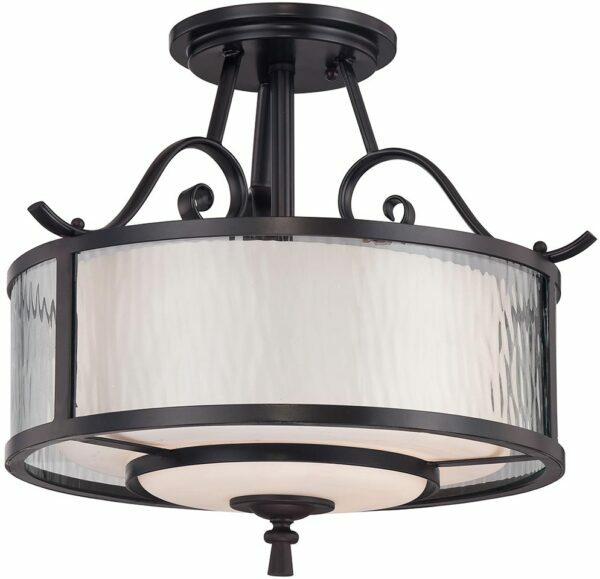 The Adonis wrought iron semi flush 3-lamp period ceiling light is finished in dark cherry bronze and features a circular ironwork ceiling mount, top bracing wrought iron scroll arms and a circular centre containing the lamps. The circular shade is a particular feature, with a heavy water glass outer ring surrounding an opal glass inner shade for a softer light. The base is fitted with an opal glass diffuser, decorative ironwork detail and drop finial. Clear water glass used over opal etched inner and base glass will create a soft and relaxed country feel. The warm dark copper toned cherry bronze finish, oval tubing and flowing scrolled arms create a classic style that will make any room feel warm and inviting.